I am an unabashed – though recently-anointed – foodNURD. I love food. I love talking about food. I love eating food. I love the Food Network (maybe a little too much). But, mostly, I love preparing and serving food to my friends and family. Luckily for me, I always ate well growing up. I enjoyed homemade meals of roasts, lamb chops, and my dad’s famous mac & cheese as well as various cuisines at restaurants around Toronto. Sure, some nights pizza or burgers from a fast food place won out, but often we could be found at our favourite Indonesian, Italian or Korean place on a Friday night. As I got older and headed off to university, my inclination to cook meals at home was non-existent. (NB – the only things I made at home before I moved out were French toast, scrambled eggs and chocolate chip cookies.) Dining out became a way of life. In first year, meals were prepared for you in the cafeteria and I enjoyed not having to do anything but eat. That attitude carried through the next three years and fast food became habit. My standards and budget for eating at restaurants were significantly lower than my parents’. I subsisted on frozen meals, McDonald’s and Mr. Noodles. It wasn’t that I didn’t love *real* food: I was straight up lazy and uninterested in learning to cook. But all that changed when I met my future husband, J. I realized quickly that homemade meals were very important to him and that my best chance to impress him was to cook something myself. I picked up the phone. While I harbor no illusions that J married me because of this dinner, it did set in motion a new idea for me: not only was eating fun, cooking could be fun, too. I became J’s sous chef, initially insisting on using the smallest knife I could find and have worked my way up to cooking the annual Thanksgiving dinner at the cottage with the family and dinner parties for groups of friends. So this blog is dedicated to all things food. I will share recipes, photos, ideas, successes, nightmares and everything else in food nurd-dom. You can also find my work as a contributor to the restaurant review blog, TOFoodReviews. 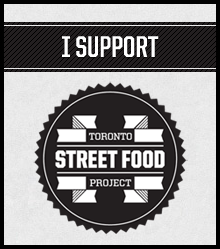 Check it out for not only great reviews but interviews and articles about food-related events in Toronto. If you’d like to get in contact with me, you can find me here on Twitter, or you can drop me a line at foodnurd@gmail.com. I’d love to hear from you. Happy eating to you all! Sadly, our favourite Indonesian place is long gone. It was on Eglinton near Avenue. To be honest, I’ve not found another good one. Anyone else out there have more luck? Very cute story! J came from a great food house! I remember some killer meals there when I was young!